Recycled Glass Market size was estimated at around USD 2.4 billion in 2017 and is predicted to grow at 7.6% CAGR during the forecast period. The dynamics and demographics associated with recycling are shifting as millennials and baby boomer enter the workforce. Increasing landfill activities and emission of green house gases during the production of glass awaken the glass recycling demand. In 2017, Malaysia glass bottle disposal was 521 metrics per day which increase the landfill, resulting in deterioration of soil and air. To overcome these problem, the stringent government regulation for vitric products will drive the product market. For instance, Commission Regulation (EU) no 1179/2012 establish the criteria when cullet should be considered as waste under Directive 2008/98/EC of the European Parliament and Council. The product stream majorly consists of glass containers, bottles and jars and flat glass. Containers, bottles and jars are 100% recyclable materials and can be recycled repeatedly without the loss in purity or quality. According to NAIMA, in 2011, the container and fiberglass industries together purchase 3.35 million tons of product annually, which is further melted and repurposed for the use in the production of new containers and fiberglass products. According to U.S. EPA, 41.3% of soft drink and beer bottles, 34.5% of liquor and wine bottles and 15% of the food and other jars were recovered for recycling in 2013. In total, nearly 34% of the overall containers were recycled which is equivalent to taking 210 thousand unit cars off the road each year. This will reduce the greenhouse gas emission, further providing sustainable environment development. Rapid industrialization resulted in rapid generation of waste globally with an alarming rate. Initiatives and awareness agendas by the government are some of the driving factors recycled packaging market. For instance, the Climate Action Plan and Sustainable Singapore Blueprint are initiatives taken by the Singapore government to achieve zero waste goal. These factors will provide the positive impact to the recycled glass market during the forecast timeframe. A key challenge in the recycled glass market is the contamination by the unwanted materials present in product waste stream as contaminated products damage new products, reduce their sale ability and alter their physical properties. If the contaminates entered the batch of new product manufacturing process, the efficient removal of containments will reduce the financial benefits of the processor that derive from the use of product, thus making them reluctant to buy low quality cullet. Designing collection strategies and increasing public awareness play a noteworthy role to overcome this problem. Deposit program and buy back/drop off program provide high quality cullet as these methods separately collect vitric products preventing the mixing of the product with other material, reducing the chance to produce low quality cullet whereas curbside collection led to low quality cullet owing to breakage during collection and segregation with other material. The collection of recycled product from drop off/buyback program generated significant revenue of over USD 1.10 billion. Drop off/ buy back are the places where businesses or householders take their product rather than picked up from the site. This method requires high participation rate and public awareness. Positive incentives such as monetary redemption, landfill authorities refusing to accept the product, or significant penalty on the collecting authorities to take them will encourage the participants to segregate the vitric products. Additionally, the growing demand for deposit program in developed nation to provide high quality cullet, thus driving the recycled glass market. This program will grow at the rate of 8.0% by the end of forecast timeframe. The recycled glass market is diversified into three principal product categories which include cullet, crushed glass, glass powder. The cullet market is further categorized into clear cullet. amber cullet and green cullet. The other niche cullet includes blue cullet, mixed color cullet, etc. Crushed glass market size was predicted close to USD 175 million in 2017 on the account of its major use in asphalt, sand/abrasive grit blasting, construction, concrete aggregate, water filtration, insulation batts, etc. Cullet hold nearly 80% of the total market share owing to its major use in glass manufacturing industry. 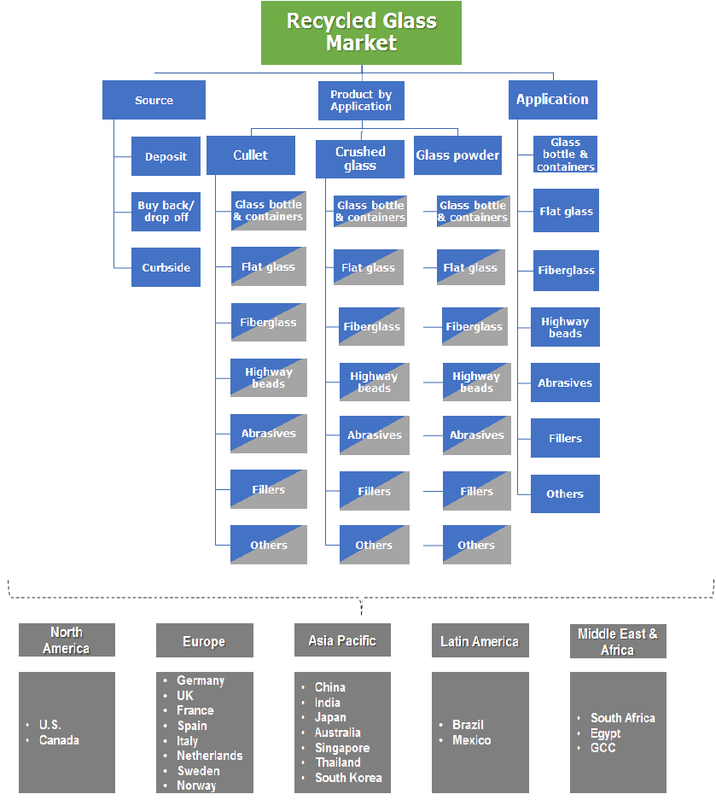 Among cullet, clear/ flint cullet holds substantial share in the product market and generated the revenue over USD 1.2 billion in 2017 owing to the large number of application and increasing demand by the glass manufacturer. According to Ohio government statistics, the state accumulated around 42% clear/flint cullet, 39% brown cullet, and 19% green cullet in 2016. The product market is categorized into various application including glass containers and bottles, flat, fiberglass, highway beads, abrasives, fillers and others such as filtration medium, hydroponic rooting medium, flux or binder in ceramics, bricks and metal foundry. Packaging bottles and containers is one of the leading applications for the product market and holds nearly 40% of the total market share. Bottle and container manufacturers realized that the use of product save energy as well as wear and tear on the furnace by melting the cullet at low temperature compared to virgin raw material. In 2017, Europe accounted for over half of the entire product market. The region will witness humongous growth owing to various regulation provided by the European government. For instance, 2008/98/EC Waste Framework Directive defines waste related terms, lay down step wise waste hierarchy and provision for waste disposal law. The recycling rate of the product around Europe was around 74% in 2017. Rising public awareness and stringent regulation will increase the recycling rate which will further fuel the product market by the end of forecast timeframe. 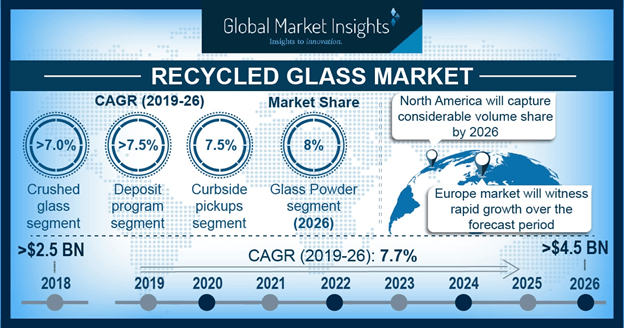 U.S. recycled glass market was valued over USD 58 million in 2017 and will grow at substantial annual growth rate by the end of forecast timeframe. According to U.S. EPA, in 2013, there are 44 product manufacturing facilities operating in 21 states and 63 product processing facilities operating in 30 states. These factors will contribute to the recycled product market by the end of forecast timeframe. Some renowned recycled glass market players include Strategic Materials, Berry Glass, Momentum Recycling, Vetropack Holding Ltd, Ardagh group, Owens Illinois Inc., Gallo Glass company, Ngwenya glass, Rocky Mountain Bottling Company, Reiling Glass Recycling GmbH & Co. KG, Balcones Resources Inc., Heritage glass, Glass Recycled Surfaces, Harsco Minerals International and Coloured Aggregates Inc. Recycled glass is the discarded material which came into picture after the rising concern about product disposal. The product is generally mixed with glass manufacturing furnace with virgin raw materials, such as limestone, sand, soda ash to produce new glass product. Reduction of greenhouse gas emission and energy conservation will fuel the product market. Growing packaging industry in Asia Pacific region will also provide a profitable growth to the recycled packaging market. Strict government standards associated with environmental pollution will further signify the recycled glass market throughout the forecast period.